-If your laptop computers are on back order but your staff isn’t, it’s best to rent laptops for immediate installation. You can extend the rental or cancel at any time with no penalty. Leases can’t be cancelled without a ‘severe penalty’. Rentacomputer.com has set up temporary offices in hotel rooms, trailers, warehouses and convention centers. Temporary offices have been set up for State and Federal Government agencies such as FEMA, the FBI and the IRS. Also legal firms, television networks covering hurricane disasters, movie studios setting up “on location”, and new building construction sites, corporate mergers and takeovers. Traveling executives won’t have to carry portable laptop computers through airports or other public transportation facilities. Executives can have technology, preconfigured and tested, waiting at their final destination! 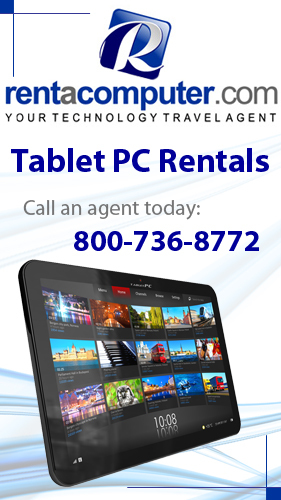 Traveling with technology is one hassle that can be easily avoided by calling a computer rental expert like a Temporary Technology Travel Agent. Temporary employees need temporary technology. By renting laptop computers you can coordinate the installation and removal of computers, printers and other technology for any period of time specified. If you hire temporary employees, hire temporary technology too. An example would be a laptop rental . Interested in renting a laptop? Get a Laptop Rental Quote. Click here if you are interested in leasing computers or laptops!